Bronchiole asthma, light micrograph of a section of affected airway. Asthma is a chronic (long-term) lung condition in which the airways are inflamed and narrowed, making it harder to breathe normally. More than 5 million people in the UK have asthma, making it the most common long-term disease affecting all age groups. During an asthma episode, inflamed airways react to environmental triggers such as smoke, dust, or pollen. The airways narrow and produce excess mucus, making it difficult to breathe. In essence, asthma is the result of an immune response in the bronchial airways. 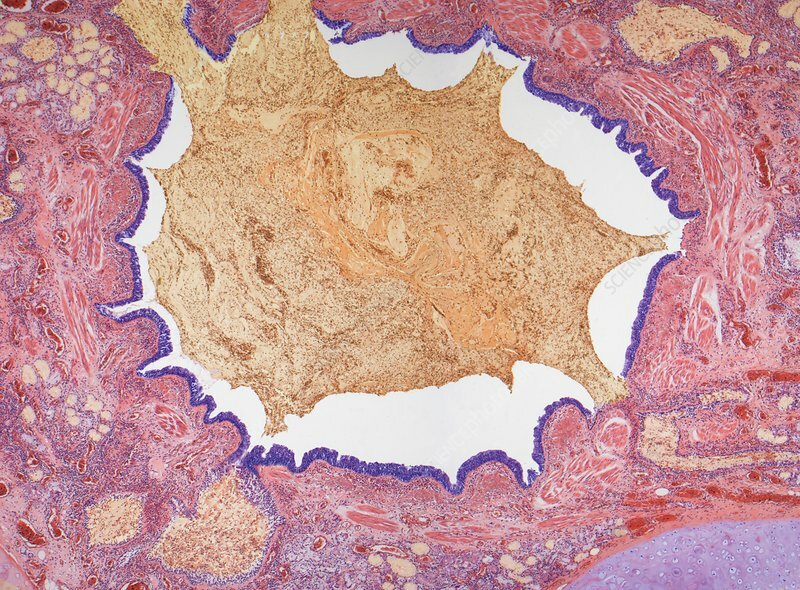 Histology shows obstruction of the lumen of the bronchiole by mucoid exudate (yellow), epithelial basement membrane thickening and severe inflammation of bronchiole. Magnification: x 60 when printed at 10 centimetres wide. Human tissue.